The Best Food team had the pleasure of attending the TGI Fridays annual conference in Liverpool last week. As usual it was a great night celebrating a fabulous brand with their amazing people. We are extremely proud of our partnership with Fridays and were absolutely delighted to be named as their Supply Chain Business Partner of the Year at the event. Huge congratulations to the whole Best Food Logistics family, this is fantastic recognition of the phenomenal service delivered day in day out. We are thrilled to announce that Best Food Logistics have seamlessly integrated KFC’s Scotland stores into our shared user network, delivering 100% on time deliveries and 100% product availability from day one. A huge well done to the Best Food Logistics and KFC teams for brilliant execution of the go live. We are absolutely delighted to announce that Chris Stott, one of our fantastic National Account Managers, has been nominated by Pizza Hut for the Account Manager of the Year Award at their upcoming Supply Chain Conference. The event is to be held on 16th October and, should he be successful, this would be the 4th time that Chris has won such an award from the clients he has worked with. This is testament to the wonderful job Chris does, day in day out, for his clients and demonstrates our commitment as a business to being the Best in all aspects of our interaction with our customers. We cannot offer the Best service without our incredible people. We all wish Chris the Best of luck for the conference. 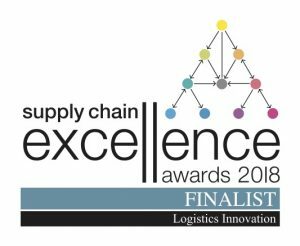 Best Food Logistics are absolutely delighted to announce that we have been shortlisted for two awards at this year’s Supply Chain Excellence Awards. We have been nominated, alongside Pret A Manger, in both the Logistics Innovation and Retail Innovation categories at this year’s event, to be held on 6th November. Best Food Logistics are delighted to be shortlisted for two awards at the Logistics Awards 2018, in the categories of “Innovation” and “Large Company Technical Innovation”, for our work in developing a real time customer performance portal. Bidvest Logistics is delighted to announce that from today, 25th June 2018, it will be trading under the new name of Best Food Logistics. Paul Whyte, at Best Food Logistics explained that the name change reflects their singular mission to be the best food service contract logistics provider in the industry; to be the Best, full-stop. “It’s what we’d like our brand to convey moving forwards – To be the best in every part of our business and make things easier for our customers and make the relationship more enjoyable. And, not only have we shortened our name, but we’re shortening our response times, with our new real-time customer service portal”. The business has also announced that it has recently agreed new long-term contracts with well-known brands such as Pizza Express, TGI Fridays, ASK Italian, Zizzi and notably, KFC. These contract wins reflect Best Food Logistics’ unique position as the leading specialist food logistics provider. Best Food Logistics are also working on a number of exciting opportunities that will unlock long-term partnerships for further restaurant chains. There will be a short period of transition from June onwards, where the new name and logo will be introduced across the business on the corporate website, uniforms, and depot signage. As the UK’s leading foodservice logistics specialist, Bidvest Logistics are delighted to confirm that we have signed a long-term agreement with KFC UK & Ireland to provide renewed supply to up to 350 of their restaurants in the North of the UK, from 26th March 2018. Last year Bidvest Logistics donated on behalf of our clients over £130k worth of food which would otherwise have gone to waste. This is equivalent to 92,000 meals or feeding a meal to 250 people every single day. FareShare, and the organisations they supply (shelters/breakfast clubs/youth centres/community groups) are incredibly grateful for the donations. Best Food Logistics is a trading division of BFS Group Limited, a subsidiary of Bid Corporation Limited.